Drilling, sampling and in-situ testing services. Our experienced drillers and our commitment to responsive service enable us to provide a comprehensive range of drilling, sampling and in-situ testing services to clients across Australia and overseas from our base in Victoria. 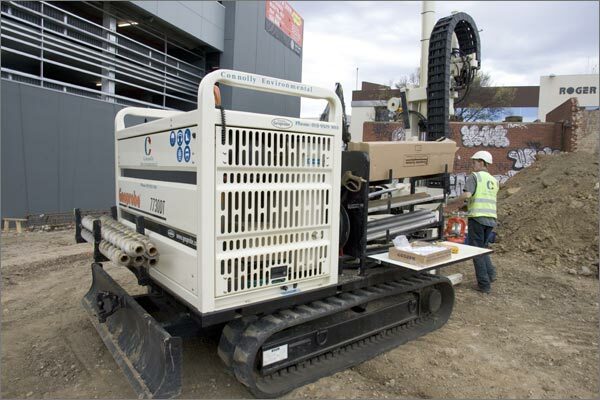 Geotechnical drilling, including diamond coring and SPT testing. Environmental drilling, including sampling and bore logging. Hydrological drilling, including well installation, and pumping tests to determine sustainable yield. Licensed Vic, NSW, WA drillers. Our Geoprobe drill rigs have direct push dual tube sampling capability. The percussive top drive hammer on the Geoprobe drives an outer casing containing an inner liner into the ground. At each 1.2 m sampling interval, the inner liner containing the continuous and undisturbed soil core, is retrieved. A new liner and the next section of drive casing are then fitted, and the casing and its liner are driven to the next 1.2 m interval. Samples are collected as needed from the soil core retained in the liner. This sampling method provides maximum sample integrity and enables the preparation of accurate bore logs. Direct push is effective in unconsolidated formations to depths of up to 20 m.
Solid augering is a fast and efficient means of installing monitoring wells. This method does not use any drilling fluid within the bore so is ideal in an environmental monitoring context. Solid augering is effective in unconsolidated formations (soil and weathered rock) to depths of up to 40 m, and can therefore be used for collection of samples from depths greater than those achievable with direct push. Hollow augering is used when formations are prone to collapse. The hollow augers act as a temporary casing preventing collapse during the installation of groundwater monitoring wells or soil vapour bores. Although the larger diameter of the hollow augers means this drilling method is generally slower, and results in a larger volume of drilling spoil than solid auger drilling, is has the advantage of enabling intact samples to be collected using a split spoon from depths greater than those possible with direct push. This method enables drilling in rock to depths of up to 100 m. The rotary air hammer is driven by a trailer-mounted air compressor. We use a dust suppression system to ensure minimal impact on surrounding properties or on other activities taking place on site. This method is used for drilling through soft rock, sand and clay layers. A special mix of clay and water (the drilling mud) is forced down the drill hole to turn the cutting bit. The mud, and the drill cuttings, are returned to the surface as a mud slurry.